A new evil named Nadakhan the Djinn is released and a new age of piracy begins. It is up to the Ninja to stop him. 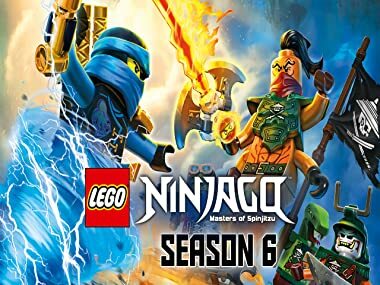 After destroying the Cursed Realm and saving Ninjago, the Ninja have discovered newfound fame. But they must be careful what they wish for because a new evil named Nadakhan the Djinn is freed and a new age of piracy has begun. The Ninja must find out as much as they can about Nadakhan before he finds the Realm Crystal to save his crew, but after the Ninja are labeled enemies by the world they used to protect, our heroes find themselves hunted by their old friend, Ronan. Falsely imprisoned, the Ninja are at their lowest point, but find an unlikely friend in an old enemy. Meanwhile, Nadakhan rescues his marooned crew and gains a new perspective, along with a new mysterious plan. The Ninja are on a collision course; to find the map to stop Nadakhan, they first must find him. Meanwhile, Jay makes a wish to change his future, but it could alter his past indefinitely. The Ninja set course to a dangerous island to find the only thing that can stop Nadakhan. Meanwhile, the Sky Pirates learn about the master plan, and a deep secret of the Ninja is exposed. Held captive on Misfortune's Keep, Jay is tested as Nadakhan does everything in his power to break his will to say his final wish. Meanwhile, the marooned Ninja attempt to escape the island. The last remaining Ninja dare to infiltrate the Sky Pirates in an attempt to save Jay and defeat Nadakhan once and for all. When the last two remaining Ninja are safe-guarded in a place no one would dare to look, the Sky Pirates discover their whereabouts and attack in search of the one who holds the power to unlock Nadakhan's full potential. The last remaining ninja gets help from old allies to help him stop Nadakhan's ceremonial wedding from taking place. When Nadakhan acquires infinite wishes, Jay only has one.